We love our kids but when we’re visiting someone they might not share the same warm and fuzzy feelings, especially as our child wrecks havoc at the hosts’ house. 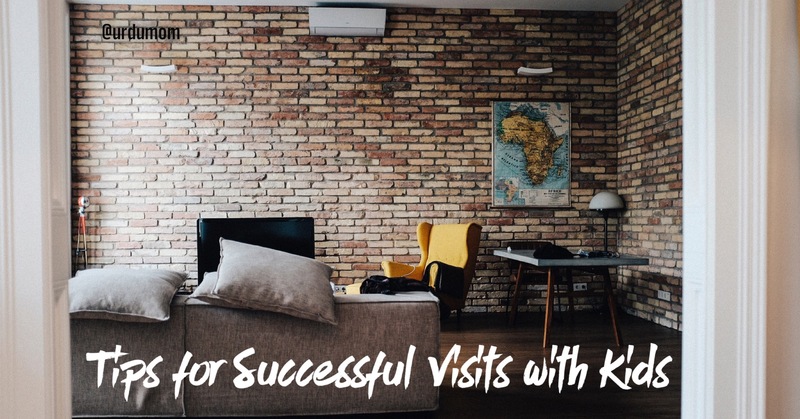 Sharing some tips for successful visits with kids to other people’s houses so that you are welcomed back (and not secretly banned) for future visits. I speak from personal experience really. I have usually felt prepared before visiting folks with my kids but we have had our share of nightmares, such as: my child rubbing his dirty hands on the host’s beautiful white dining chairs, diaper accidents and meltdowns. My friends are angels really that we are still friends after all this! Since everyone might not be as forgiving as my amazing friends, sharing some tips for successful visits with kids (or at least a genuine attempt at it)! You know your child’s schedule. Pick the time of your visit when they are happy and not sleepy. If you’re invited to an event you can’t really negotiate the time if it does not suit your children. You can however adjust things at your own end, either by giving the kids some rest before the visit or having one of the parents stay at home with the children. Special note: If a child sleeps at 8pm, there is no way they will be happy at a dinner that starts at 9pm. The responsibility to entertain your children is yours. Don’t assume that your host will have toys for your kids and TV shows appropriate for their age, especially when the hosts don’t have kids of their own or the same age as your kids. Take along a small bag of quiet toys for your child (look at this idea of a Busy Box). Make sure there are no crayons, markers or paints in there. If the host has children the same age as yours, don’t take any toys but do talk to your children about sharing nicely. Keep an eye on what your children are upto and keep them away from things they can break or create a mess with. If your child is playing with the family’s heirloom vase, it’s not going to end well. My husband and I usually take turns keeping an eye on the kids so the other person can catch a break. If your children are picky eaters, bring along something to eat for them. Don’t expect your host to have organic blue berries, ripe bananas or what ever your little darling is into these days. I usually feed my kids before going to someone’s house. That way whatever they eat is gravy and I don’t have to worry about them going crazy on a hungry stomach. When the kids eat, make sure they sit in one spot and aren’t running around with the food. Ask the host if there are non-breakable plates for the kids and where would they prefer the kids to eat. Most will gladly give the kids plastic plates and show a safe spot. The easiest hack is to lay a plastic sheet on the floor and ask the kids to sit on it and eat. Before you leave try to do a quick cleanup of the toys your kids spread all over. Timing your exit is crucial. I always say there is a respectful time to leave and then there is that exit you make 20 minutes later with a wailing child. Leave before your child is over-tired. You can give them a 5 minutes heads up and make your own goodbyes in the meanwhile. If your child begins to get agitated skip the cleanup step and make a quick exit! Hope these tips help you! What is some advice you would like to share on the topic? Always love hearing from you! Next Post Eight Fun Ideas for Girls’ Night Out! Excellent article! All parents have our own horror stories . I do like the suggestion of feeding them before leaving. I’d just Like to add that as the kids get a bit older talking about Manners while visiting are a must. Beyond teaching them to say salam, we need to communicate that the host’s house rules are equally important as our own. Tidy up after play and no running are some basic ones you can discuss on the way to the host’s place. Also prearrange a cue for them to understand they are misbehaving without creating a scene. It could be a word or a gesture. Hats off to you for number four!! I’ve always fed my kids to their fullest in the comfort of the home. It has many benefits: one, they are not cranky at the party; two, they are not making any mess i.e, spills and all; three, you get to enjoy your party and food without running after your kids; four, if they like to eat something at the party that’s a bonus:) and last, you are not bothering your host with your kids non stop demands. I’ve seen moms running after their kids to feed them for hours at the party and I always wonder ‘why?’. Yes, totally agree with you! !